This sundal recipe is often made at my home; be it during festivals or just on an ordinary day. I've grown with this recipe and never got bored. I would say this is perfect evening snack for kids as it is rich in protein and of course easy to prepare. I make this for my son atleast once during a week though he munches very little of the sundal. 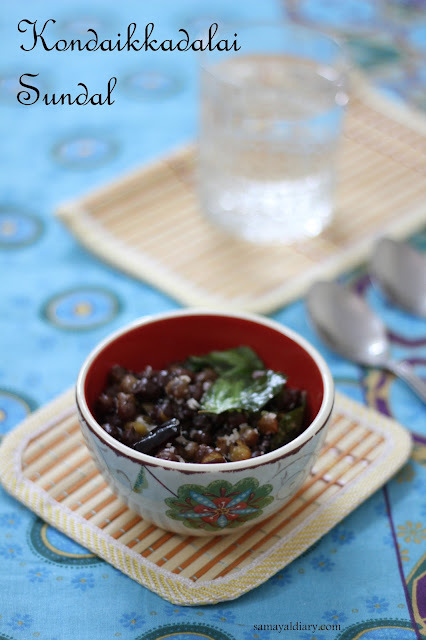 I prefer black channa for the sundal recipe to white channa or kabuli channa as I feel it tastes quite bland. 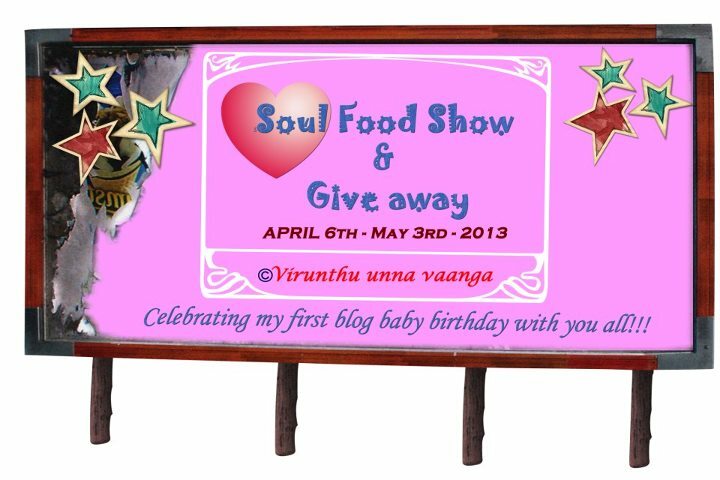 My Friend Viji at Virundhu Unna Vanga is hosting an event named Soul Food Show at her space to celebrate her first blog anniversary. She is so sweet and so are her recipes. I had a chat with her only for few minutes but I feel as if I knew her since my childhood. I request fellow bloggers to contribute as much as possible to make her event a huge success and she has announced fabulous gifts too. Soak Kondaikkadalai in water overnight. Pressure cook Kondaikkadalai for 2-3 whistles. Heat Oil in a Pan. When hot, add mustard seeds. When they start popping up, add curry leaves and chillies. When they start sizzling, add cooked Kondaikkadalai. Sprinkle salt and stir well. Fry till the tempering gets mixed well with Kondaikkadalai. Now add grated coconut. Fry for few more seconds and till done. Serve as an evening snack or an offering to God. Linking this recipe to Soul Food Show at Virundhu Unna Vanga and Walk through memory lane happening at My Home Mantra initially started at Gayathri's Cook spot and Healthy Me & Healthy Us event at Mharo Rajasthan Recipes.. Nutritious sundal,one of my favourite evening snacks. Very healthy and delicious one !! That is so heavenly with the fragrance of curry leaves. My kind of flavored snack. Lovely and healthy snack, first time to your space. came through vimithas space. How to prepare basic Indian Tea?